WASHINGTON (REUTERS) - As US President Donald Trump and his allies ramped up threats of military action against Syria this week, Syria's military has repositioned some air assets to avoid fallout from possible missile strikes, US officials told Reuters on Wednesday (April 11). The officials declined to comment further and it was not clear whether the Syrian actions would affect US military planning for potential action against Syria over a suspected poison gas attack. But Syria's attempt to shelter aircraft, perhaps by locating them alongside Russian military hardware that Washington might be reluctant to strike, could limit damage that the United States and its allies might be able to inflict on Syrian President Bashar al-Assad's military. A similar assessment regarding Syria's actions was delivered by the Syrian Observatory for Human Rights, a Britain-based war monitor, which said pro-Syrian government forces were emptying main airports and military air bases. For days, Mr Trump has been sharpening his rhetoric against Syria and its backers, Russia and Iran, calling Mr Assad an"animal" on Sunday. On Wednesday, he offered the clearest sign yet of his willingness to attack Syria, declaring that missiles "will be coming" and criticising Moscow for standing by Mr Assad. Mr Trump's decision to disclose his decision to strike as well as the kind of weaponry to be used in a future military operation was certain to frustrate military planners, who hold such information closely. The United States was actively collecting evidence on how Syria and Russia were responding to US threats, officials said, adding that Washington believed Syria and its allies were almost certainly also moving personnel and military equipment - beyond just aircraft - into protective locations. One of the officials noted that Syria and Russia relocated their equipment and personnel a year ago - the first and only other time Mr Trump ordered missile strikes on Syria in response to a chemical weapons attack. Last year, the US military formally notified Russia over a hotline shortly before 59 Tomahawk cruise missiles struck the Shayrat air base. The US goal was to minimise risk to Russian or Syrian personnel. At the time, the Pentagon claimed that a fifth of Syria's operational aircraft were either damaged or destroyed. "By telegraphing our punch so early, you give the Syrians the opportunity to harden themselves as a target and you give them the opportunity to have more time to think through what our potential response might be," said Ms Christine Wormuth, a former undersecretary of defence for policy in the Obama administration. The Russian military said on Wednesday it had observed movements of US navy forces in the Gulf. 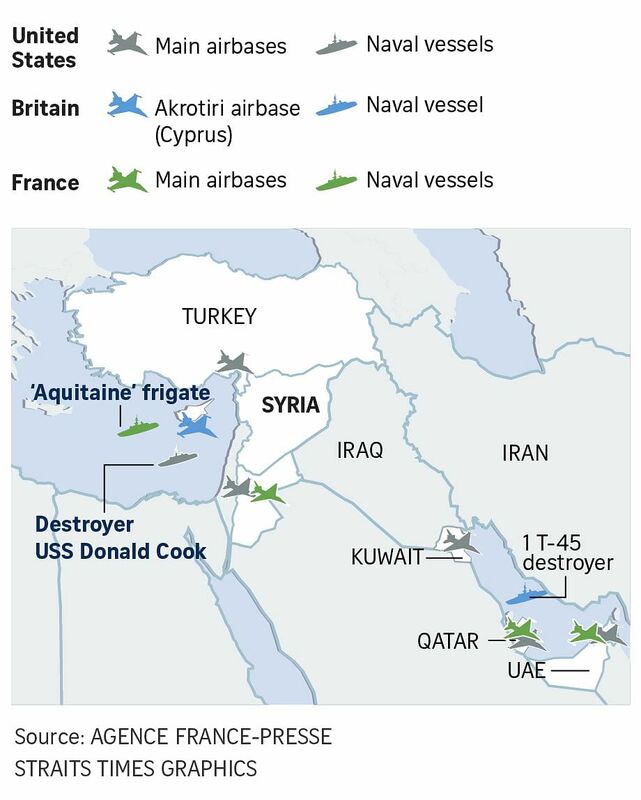 Any US strike would almost certainly involve the navy, given the risk to aircraft from Russian and Syrian air defences. A US guided-missile destroyer, the Donald Cook, is in the Mediterranean, and other naval assets could be used in an attack. Ms Wormuth said the early telegraphing of US military actions also allowed Syria, Russia and Iran to think about "how they in return might try to fight back against it". Mr Trump himself has in the past repeatedly criticised other US leaders for telegraphing actions to adversaries, and he refused to offer advanced details, for example, on his strategy for dealing with North Korea. US Defence Secretary James Mattis, a retired Marine general, has been internally pushing Pentagon officials to become more observant of operational security, particularly in their conversations with the news media. General Mattis did not answer a question about whether he was concerned about telegraphing US moves in Syria. But he was cautious in his public remarks about Syria on Wednesday, disclosing little about the decision-making process ahead of talks at the White House and saying the United States was still reviewing intelligence about the attack itself. Two US government sources told Reuters the United States still did not have 100 per cent solid evidence of what nerve agent was used in Syria and where it came from. However, there is some evidence it was sprayed from helicopters, they said.